Synopsis : Facts and information including recent research news and treatment options for Neurological Disorders affecting the human nervous system. A neurological disorder is any disorder of the body nervous system. Structural, biochemical or electrical abnormalities in the brain, spinal cord or other nerves can result in a range of symptoms. Examples of symptoms include paralysis, muscle weakness, poor coordination, loss of sensation, seizures, confusion, pain and altered levels of consciousness. Neurology is a medical specialty dealing with disorders of the nervous system. Specifically, it deals with the diagnosis and treatment of all categories of disease involving the central, peripheral, and autonomic nervous systems, including their coverings, blood vessels, and all effected tissue, such as muscles. Physicians who specialize in neurology are called neurologists, and are trained to investigate, or diagnose and treat, neurological disorders. Although many mental illnesses are believed to be neurological disorders affecting the central nervous system, traditionally they are classified separately, and treated by psychiatrists. Neurological symptoms are symptoms caused by, or occurring in, the nervous system. The nervous system consists of two anatomic parts. The central nervous system, which includes the brain and spinal cord, acts as a central processing station. The peripheral nervous system transmits sensory information between the muscles, tissues and nerves in the rest of the body to the brain. When these connections are disrupted, neurological symptoms occur. 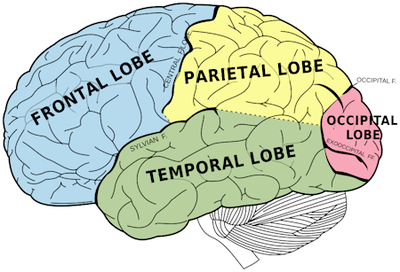 Diagram of the human brain showing the four lobes - frontal lobe, parietal lobe, occipital lobe, and temporal lobe - of the cerebral cortex. The cerebrum or cortex is the largest part of the human brain, associated with higher brain function such as thought and action. There are over 600 known neurological disorders and conditions that affect the human nervous system and for many of them treatment options are extremely limited. In addition to the physical and mental toll these conditions take on patients, their families and caregivers, they also have an enormous economic impact, resulting in hundreds of billions of dollars annually in medical expenses and lost productivity. Sometimes physical injury to the brain, spinal cord, or nerves can be the cause of neurological disorders. Sometimes they can result from biochemical causes. Other times, the cause may be unknown and only the effects are seen. Neurological disorders are common and can be life-threatening, like brain tumors and strokes, or less harmful (though potentially debilitating), like tension headaches and sleep disorders. Up to 1 billion people, nearly one in six of the world's population, suffer from neurological disorders, from Alzheimer and Parkinson disease, strokes, multiple sclerosis and epilepsy to migraine, brain injuries and neuro-infections, with some 6.8 million dying of the maladies each year, according to a United Nations 2007 report. The US National Institute of Mental Health (NIMH) estimates that about 1 in 4 American adults suffer from a diagnosable mental disorder in any given year, with nearly 6% suffering serious disabilities as a result. The US National Institute for Neurological Disorders and Stroke (NINDS) estimated in a 2006 report that about 50,000 new cases of Parkinson's disease are diagnosed in the US each year, and the total number of cases in the US is at least 500,000. Per 1,000 children, estimated prevalence was 5.8 for autism spectrum disorder and 2.4 for cerebral palsy; for Tourette syndrome, the data were insufficient. In the general population, per 1,000, the 1-year prevalence for migraine was 121, 7.1 for epilepsy, and 0.9 for multiple sclerosis. Among the elderly, the prevalence of Alzheimer disease was 67 and that of Parkinson disease was 9.5. For diseases best described by annual incidence per 100,000, the rate for stroke was 183, 101 for major traumatic brain injury, 4.5 for spinal cord injury, and 1.6 for ALS. (www.ncbi.nlm.nih.gov/pubmed/17261678). The WHO estimates that unipolar depression is the third leading causes of disease burden worldwide, (after lower respiratory infections and diarrheal diseases), and the number one cause in the high-income countries. Autism and Autism Spectrum Disorders are now estimated to affect 1 in 88 children living in the US, according to a 2012 report from the Centers for Disease Control. In its 2012 annual report, the Alzheimer's Association (AA) estimates that 5.4 million people in the US have Alzheimer's disease (AD). By 2050, the AA estimates that between 11 million and 16 million Americans will have the disease, with one new case appearing every 33 seconds. Early Indicators: High Functioning Autism and Aspergers Syndrome - Michelle Fattig writes on understanding and acknowledging autism, ASD, high functioning autism and Asperger's Syndrome. People Who Hear Voices Can Detect Hidden Speech in Unusual Sounds - Research reveals people who hear voices may also use unusual skills when their brains process new sounds. Neurological Link Between Religious Experiences and Epilepsy - Research supports the notion that the human propensity for religious or spiritual experiences may be neurologically based. Cat Ownership Not Linked To Mental Health Problems - New research reveals no link between cat ownership and psychotic symptoms, contrary to a belief that people who grew up with cats were at higher risk of mental illness. Possible Major Advance for Neurological Diseases Following New discovery - Discovery of new mechanism that controls the way nerve cells in the brain communicate with each other to regulate our learning and long-term memory. Citation: Disabled World. (2019/01/08). Neurological Disorders: Types, Research and Treatment News. Retrieved 2019-04-19, from https://www.disabled-world.com/health/neurology/ Direct Link: Neurological Disorders: Types, Research and Treatment News - Facts and information including recent research news and treatment options for Neurological Disorders affecting the human nervous system.